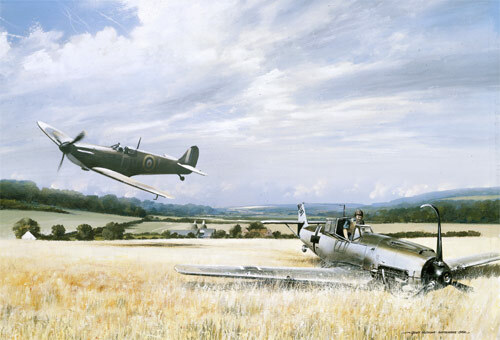 A collection of 12 limited edition prints (originally 525 of each), printed on heavyweight art paper. 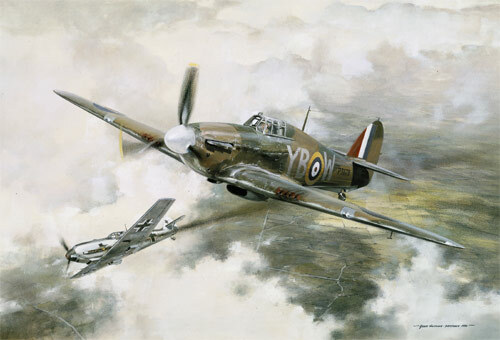 Each print is individually hand-signed by at least four distinguished Battle of Britain pilots, including Johnnie Johnson, Hugh Dundas, Al Deere, Ray Holmes and many more! Produced in 1990, there are only a small number still available. 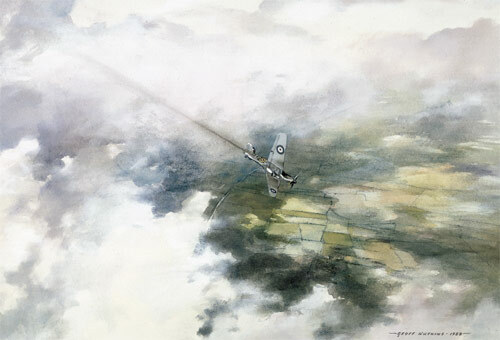 Set No.1 was presented to Her Majesty The Queen Mother at Clarence House in London, and supported by the Daily Telegraph, the initial sales of these prints raised £100,000 in support of the RAF Benevolent Fund 'Reach for the Sky' appeal. 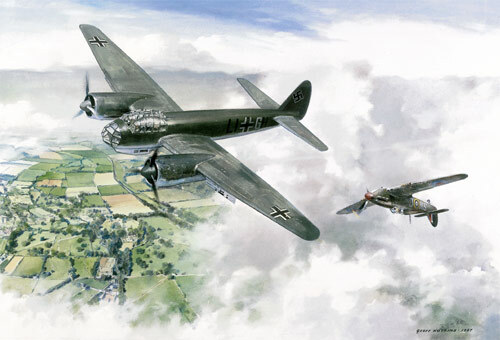 Missing Sergeant John Brimble, No.73 Squadron, posted missing on 14th September 1940. 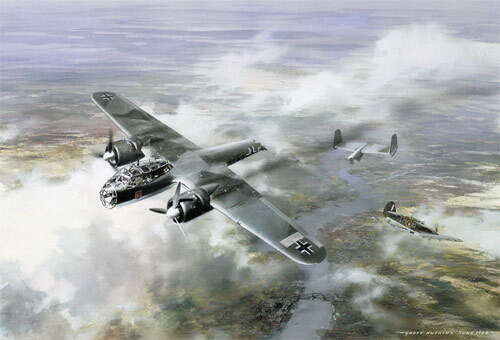 Battle over London Sorry, sold out! 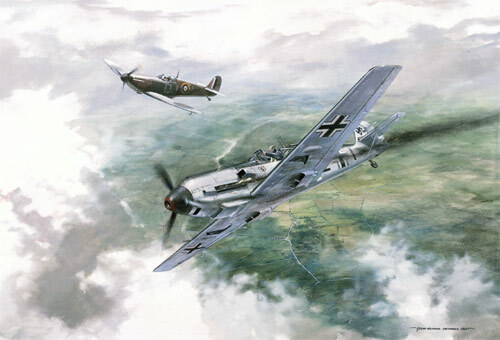 Fallen Eagle Leutnant Hermann Ripke of 8/JG26 falls victim to Pilot Officer Tom Sherrington of No.92 Squadron high above Sevenoaks, Kent on 25th October 1940. 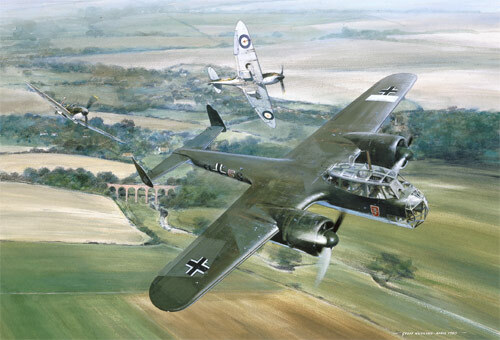 Moment in Time Squadron Leader Tom Gleave of No.253 Squadron attacking a Junkers Ju88 high above Shoreham, Kent on 31 Aug 1940. 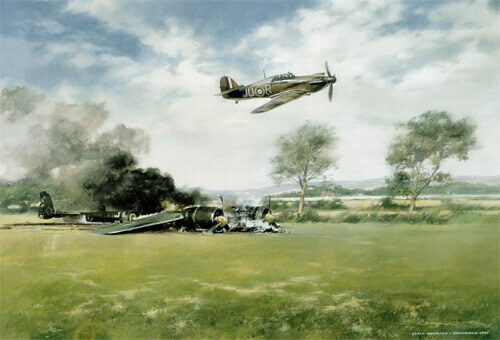 Eagle Day Smoke rises from the wreckage of a Dornier Do 17 bomber, brought down near Biggin Hill on 18th August 1940 by Sergeant Ron Brown of No.111 Sqdn. 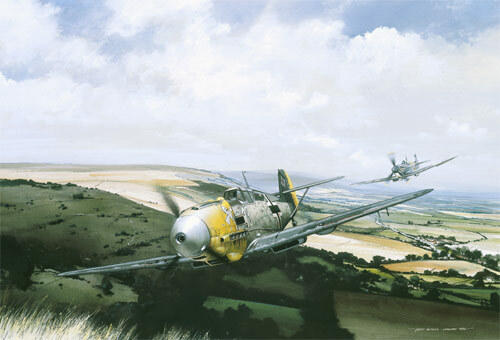 The Chase Unteroffizier Anton Zimmermann's Messerschmitt Bf109 of 7/JG54 is in trouble as he is pursued at low level by a Spitfire on the morning of 27th Oct 1940. 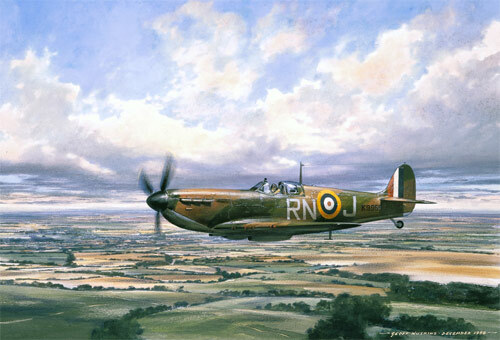 Spitfire on PatrolSorry, sold out! 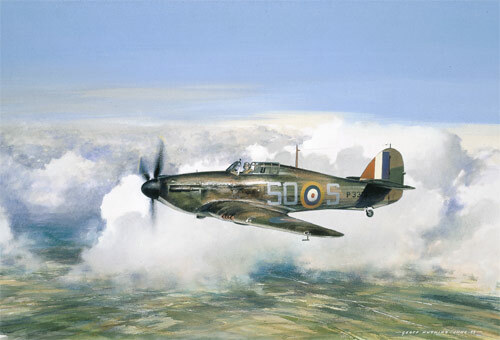 Hurricane A Hurricane of No.145 Squadron flown by Pilot Officer "Jas" Storrar who at 18 was the youngest of The Few. 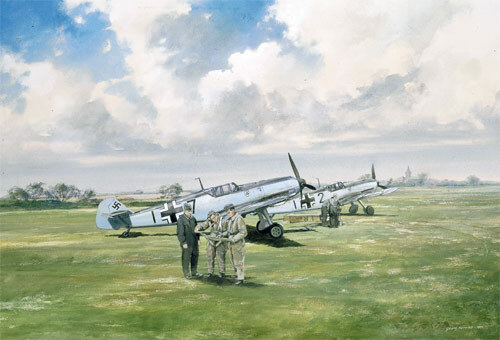 Somewhere in France Messerschnitt Bf109 fighters from JG26 on an airfield near Bournonville in the Pas de Calais, August 1940.